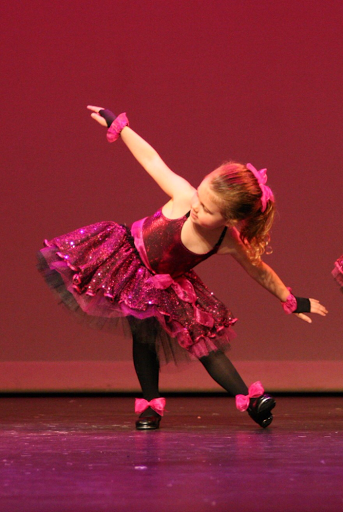 Earlier this month, the dance school our granddaughter attends had the final show for the year. 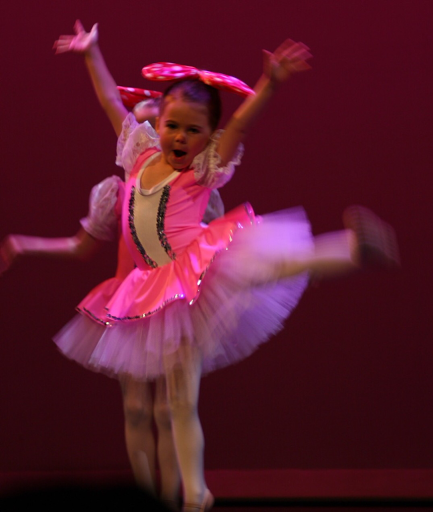 There were great performances by all of the girls and young women in ballet, tap and modern dance. Sylvie had a great time, enjoying every minute in the spotlight. 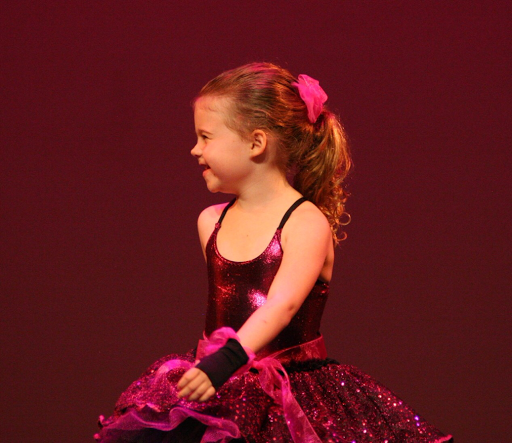 If ever a child was different from her mother in her love of the spotlight and performance, it is Sylvie. 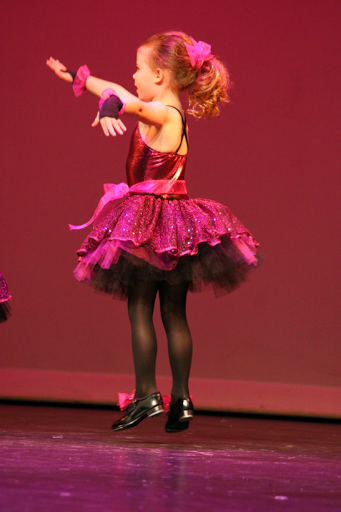 then did her Broadway Babies tap piece. She exudes pleasure in every minute of the movement, rhythm and music. 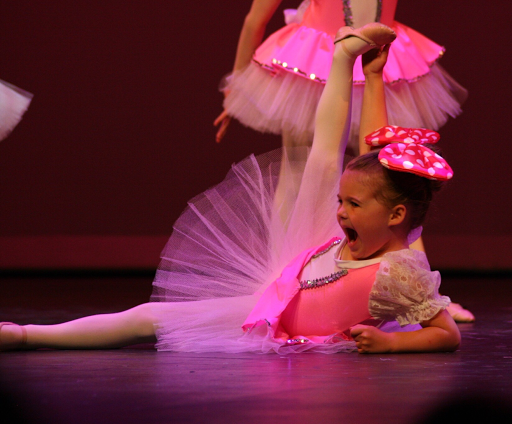 Somehow, dance is in her soul. Next year she wants to do three dance classes which may not be possible as her sister is beginning classes too. 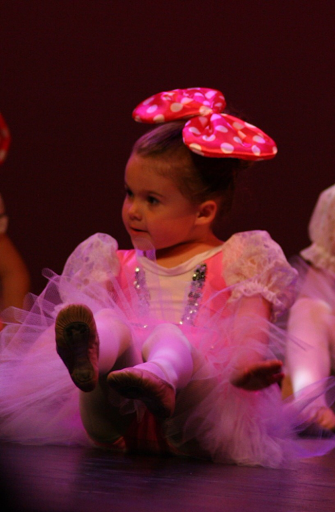 It is wonderful to see our granddaughter's joy in dance at five years old. Who knows how long it will last but her family is on this journey with her and enjoying every minute. There are many interesting animals living along the boardwalk by the bay. 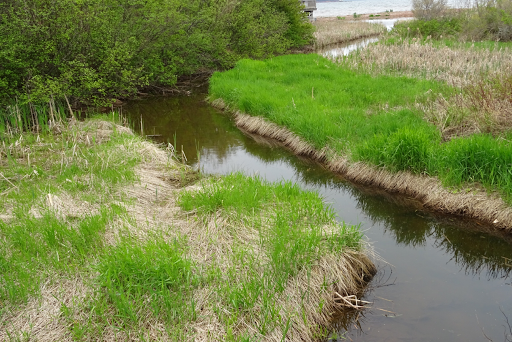 While we have not seen it yet, there is at least one beaver which is working to dam one of the streams which empties into the bay. It must be frustrated though. 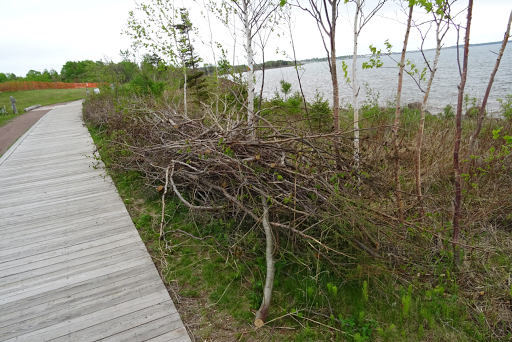 We have seen the water level rise just north of the trail at one location but didn't realize beavers were responsible. One day, another walker told us about the huge beaver he saw swimming up the stream. every day he walks because the city would move the beavers if they flooded the trail area because of their dam. 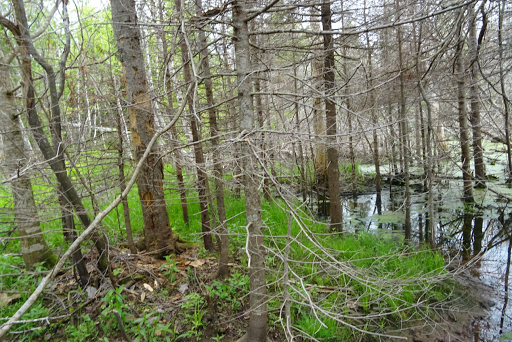 Beavers need deep water for protection from predators, as well as to float food and building material for their lodge. 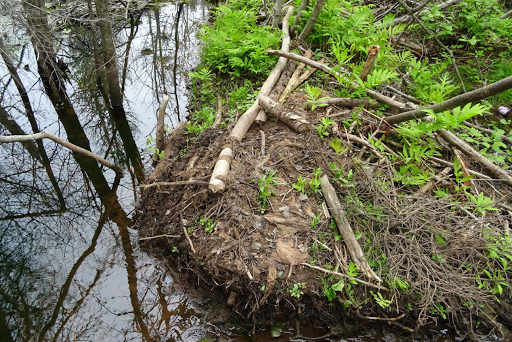 If the beavers can't achieve a sufficient depth of water, they will move anyway. Besides the flooding, others are concerned about the number of trees the large rodents chop down. 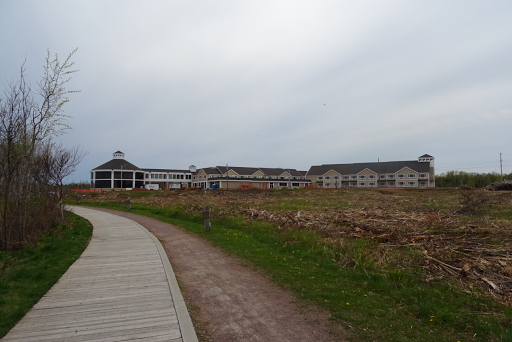 However, there is a new hotel/spa being built along the trail by a foreign industrialist. but also on the seaward side of the boardwalk. Nature does not trump jobs. Remember the song Big Yellow Taxi by Joni Mitchell? Written in 1970, the song "goes to show" how little has changed. We still "pave paradise to put up a parking lot." Big Yellow Taxi by Joni Mitchell is here. 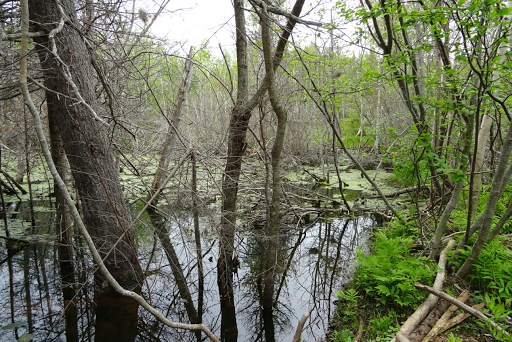 We hope to see the beavers before they decide to leave on their own or are evicted. 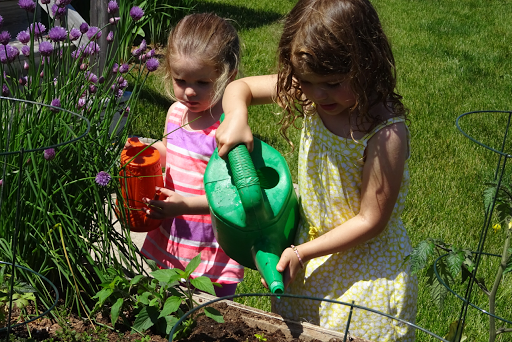 When the grand-girls visited last week, we planted cucumbers, leeks, green onions and herbs in the garden box. Now they have plants to water each time they visit. The girls love cucumbers and they are looking forward to picking and eating them. Over one hundred years separate my grandparents and their great great granddaughters. 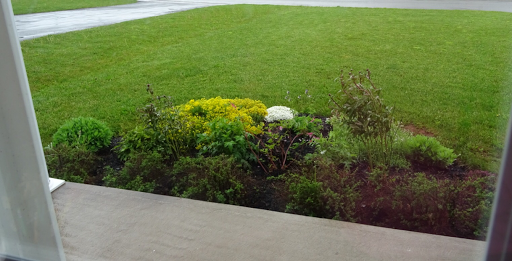 However, I know Gus and Monnie would be pleased their descendants are learning to grow food. 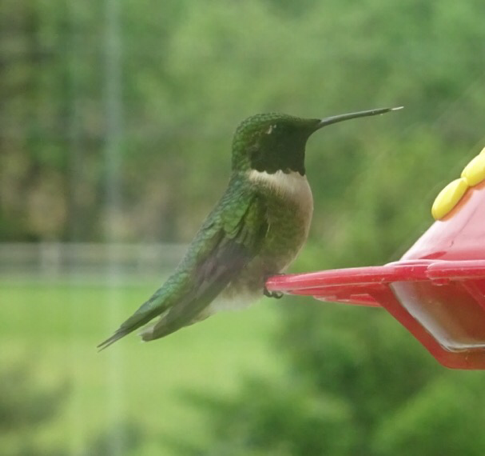 I was not familiar with hummingbirds in Newfoundland. 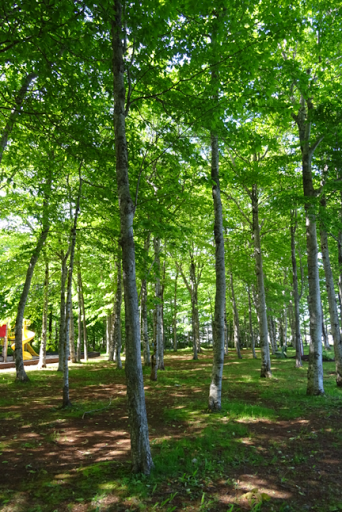 While there are also hummingbirds on Prince Edward Island, I did not see any of the humming creatures until we went to Island Preserve Company in New Glasgow, PEI, last week. 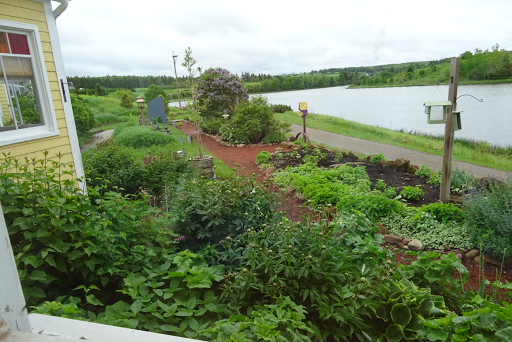 Our table overlooked the garden and the Clyde River, while outside the window was a hummingbird feeder. I had my camera and hoped to get some pictures of the garden before we left there. 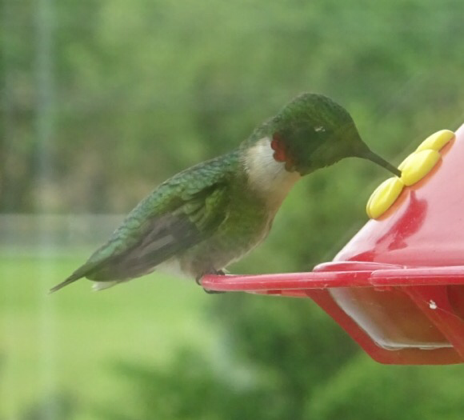 However, I was lucky enough to get some shots of a tiny red-throated hummingbird. Because the photos were taken through the glass, they are not sharp images, but I was thrilled to photograph the little creature anyway. Through the window, the red of the throat was only visible when the bird moved a particular way. One photo shows the tongue protruding from the end of the beak. 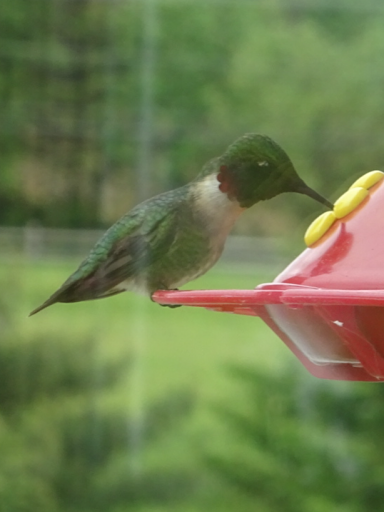 The fluorescence of the feathers was barely visible but the emerald green was beautiful. This brief, but interesting video shows how the hummingbird's tongue works. While I have always enjoyed my visits to Island Preserve Company, this one was extra special. Last week, on my way home from the store, I dropped by the park. 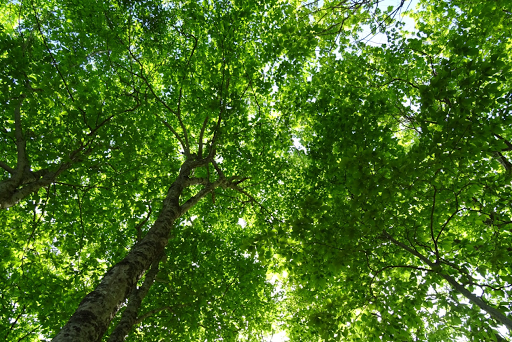 The setting was beautiful as the canopy was full of leaves. 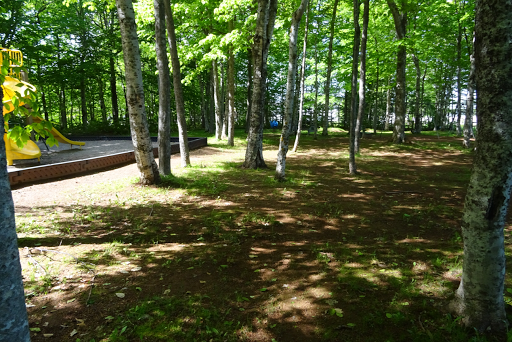 The floor of the park was tidy, having been raked earlier in the spring. 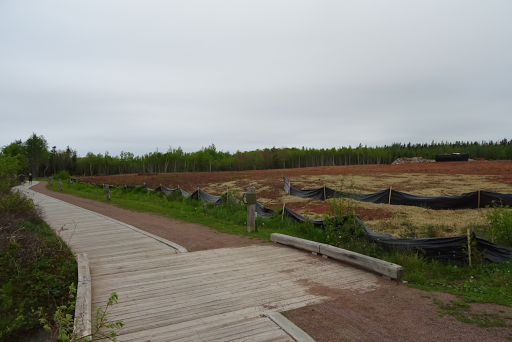 At ground level, there were patches of grass in the red soil. Some persistent rays of sunlight found their way to the floor, creating a design of light and shade. In several places, clearings let in a flood of light, highlighting certain areas. 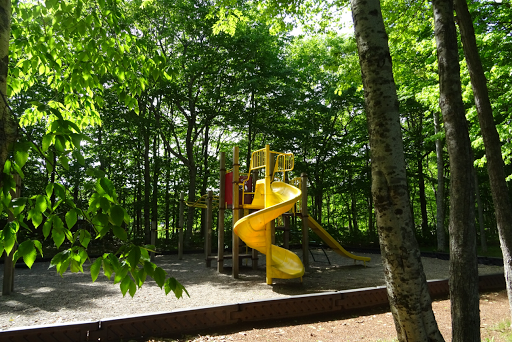 The slide stood out more than its usual yellow allows. were barely visible as nature had done her job. 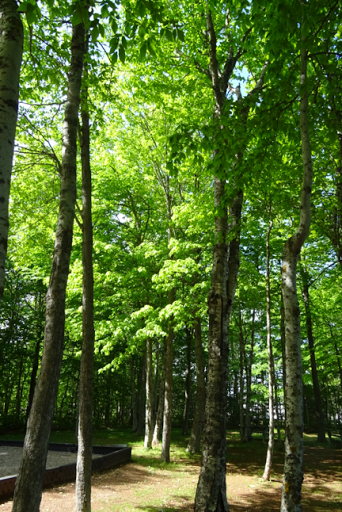 The majesty of the trees was evident standing there among these natural giants, clothed in their late spring glory. 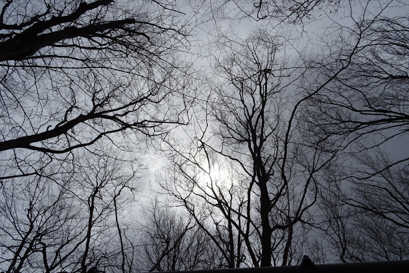 Breathing deeply, I took in the scene for a few minutes in the quiet of mid-morning, then continued home. 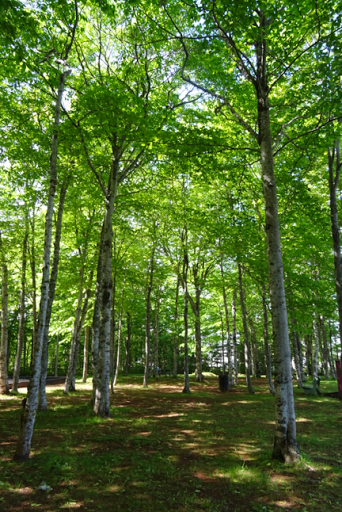 However, there is comfort in knowing that the park awaits those who take the time to stop and just breathe. My home province of Newfoundland has a rich culture. The early settlers, mainly from England and Ireland, brought their culture and traditions with them. The isolation of the island and the further isolation of the outport villages stretched along the coast, meant the exposure to other cultures and traditions was limited. People kept their family heritage alive through their stories, music and songs. The influence of Irish and English culture is certainly evident in the music, as old songs and jigs from the homelands have survived. However, creative people composed their own lyrics and music, many passed on through the oral tradition. 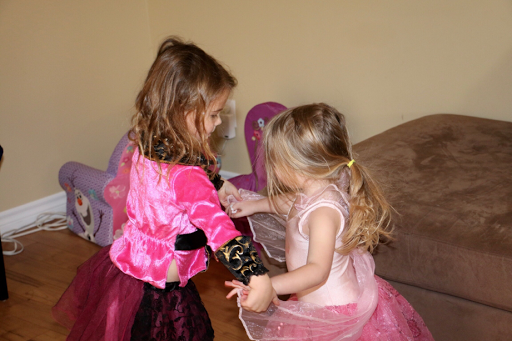 Today in Prince Edward Island, our granddaughters love to dance any time they visit and I usually sing Newfoundland songs for them. When I switch to another song, they ask for the Newfoundland songs again. Their favourite is a traditional song called I'se da B'y, which means I'm the boy in Newfinese. The girls call it Hip-Yer-Partner, which is part of the chorus. I expect before long they will be singing the song themselves. 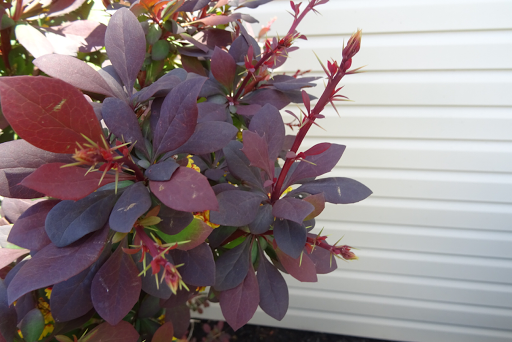 Below is a version of the song by Great Big Sea, a group of Newfoundland musicians. The words are included. It is a toe-tapper and I usually clap along with it too. Enjoy! I'se the B'y is here. 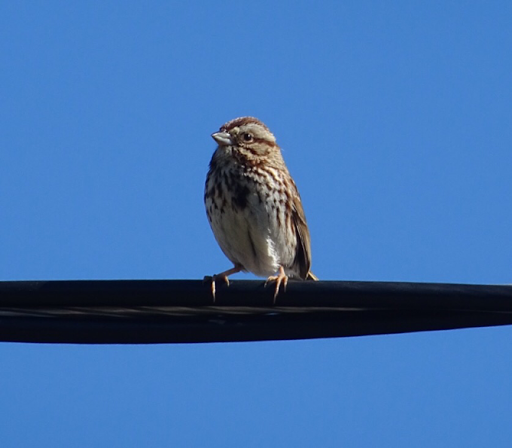 Last Monday I wrote about our resident song sparrows. We didn't see the birds for the remainder of the week, so we checked to find the nest. It is the straw at the center left of the picture. The birds are long gone now, but not forgotten. Maybe they will return another year. The garden is in a constant state of change this time of year as some blossoms go to seed and other buds burst forth with their unique bloom. There are new things to see every day. 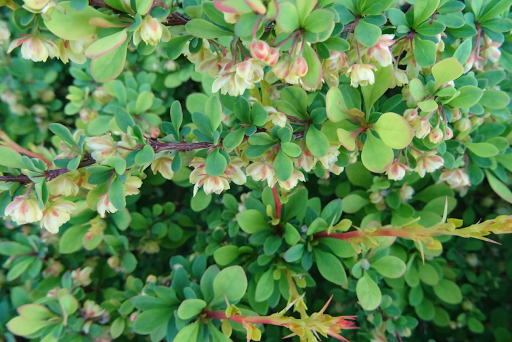 Such perfect miniature blooms are worth a closer look. Or do you prefer pink? You have to get close to appreciate the beauty of these miniature pink flowers. These beauties are fading now. But this purple and white bloom is the first of many to open in the next week. Toys. Every toy known to people, or so it appears anyway. Our granddaughters have a playroom at their home which is full of toys, often making it difficult to navigate the floor with all the small pieces under foot. On a recent visit, I enlisted our oldest granddaughter, Sylvie to help me tidy the room so we could play there. 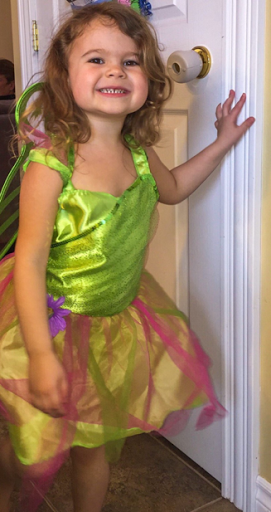 She was dressed in a fairy costume. "Ah man, I hate doing that," she said as she disappeared around the door. "Five minutes and we'll be able to play in here," I said in my typical Nan fashion. "Come on now. Two of us will have this done in no time." She appeared, worked for a few minutes, then left again. I continued to sort the items, depositing them in the bins lining the wall. Before long, only a few items remained. Sylvie reappeared. "I found it," she said. I stopped to watch as she waved a stick with a star on the tip over the room. "There," she said. "I just have to wave my magic wand and it's all done." "Excuse me," I said, rather indignantly. I put my arms around Sylvie and tickled her as we sat on the floor. 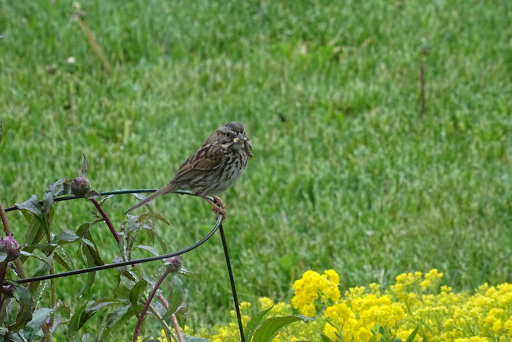 A pair of song sparrows built their nest in our flower bed at the front of our house. They are beautiful creatures, having gray chests with russet dappling. Watching their behaviour over the last week has made us huge fans of the birds, who show fascinating skills as they provide for their young. They are wary of the environment, watching carefully to ensure there are no threats to their young before they return to their home. 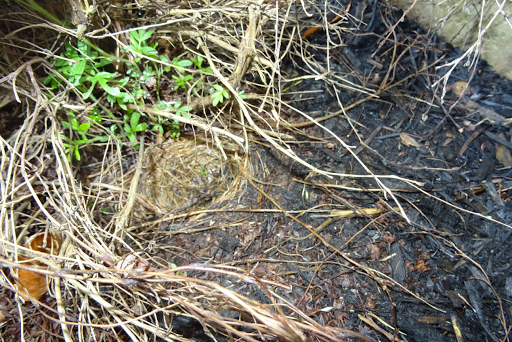 The nest is not visible in the mulch under the bushes but we have watched them with interest as they furtively make their way back to their abode. When they have been away for a time, they walk around the flower bed before they go to the nest. If they have a beak full of food, but other birds or humans are around, they stand around holding the food, waiting for the perceived threat to leave. 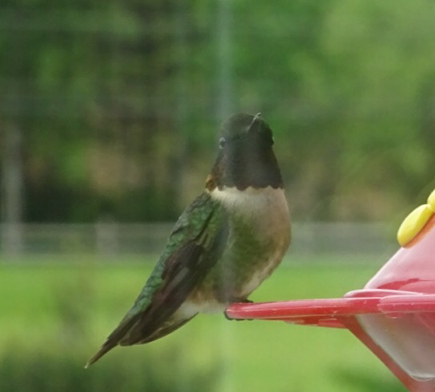 My husband, Rick and I watch them through the living room window. 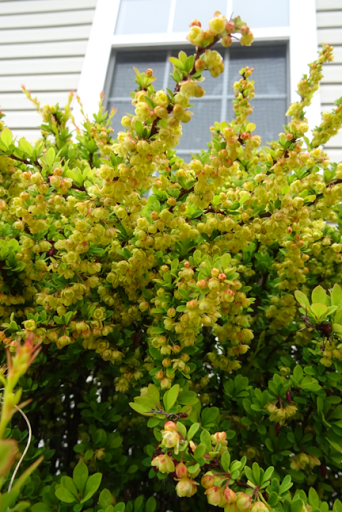 Undetected by the birds, we have a great view of their activity, though we have never seen the nest. Not wanting to disturb them, we are glad of our vantage point by the window, and take turns with the camera, waiting for them. Like paparazzi lying in wait for the rich and famous, or stalkers who lurk nearby waiting for their prey, we wait. 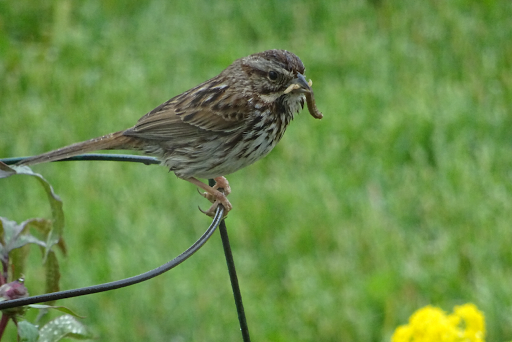 The birds toil all day, back and forth to the nest with a variety of food hung from their beaks, such as maggots, caterpillars, slugs and insects. 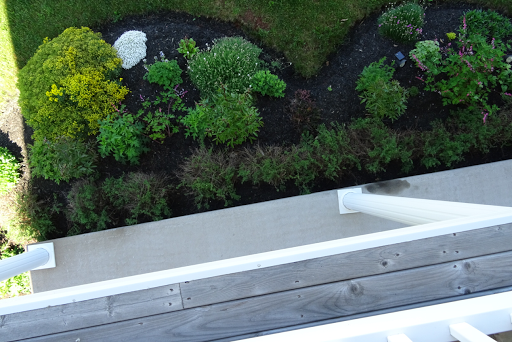 If we are on the balcony, a floor above the nest area, they stay on the roof of the garage or the power line to the house, waiting for us to leave. With their mouths full, they make a noise we imagine is a warning to the partner or a distraction to divert attention from their young. It also appears they clean out the nest, bringing out what may be dried feces as they do the nest-work. 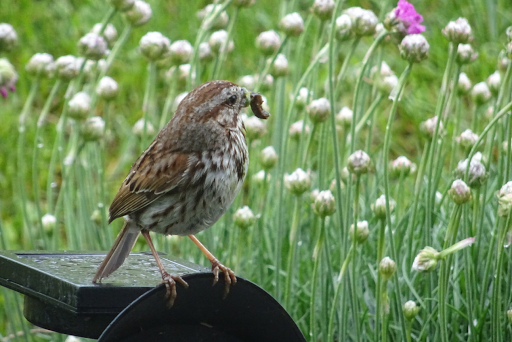 On one occasion, Rick was on the flower bed in the area of the nest and one of the birds landed near him. It hopped away from the area as Rick focussed his attention on the bird, rather than where the nest might be. It appeared to be a deliberate effort to distract an intruder. 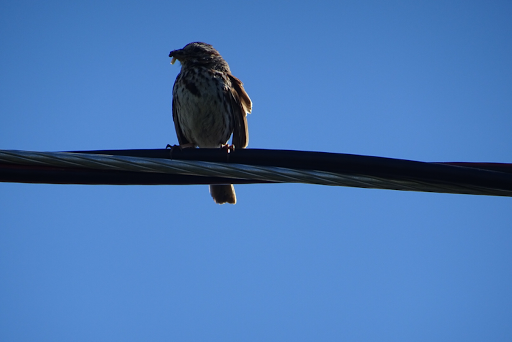 One day recently, while I worked on the garden, I noticed the two, facing me from the power line perch, each giving the warning chirp. When I moved behind them, they turned around so as to continue to watch. When I moved away, they flew to the neighbors' roof and observed from that location. Meanwhile, we are settled in from our own perch at the desk by the front window, camera ready. The money shot will be a photo of the young birds as they leave the nest. What are the chances? 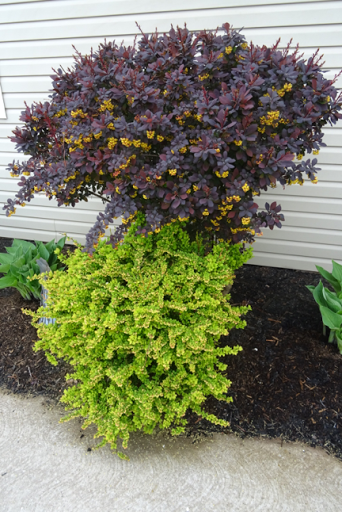 These are beautiful barberry shrubs but trimming them can be dangerous. The thorns are long, sharp and plentiful. 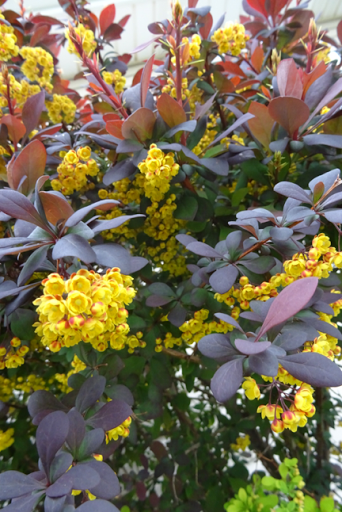 However, the bees love the blossoms as much as I do. Life on rural Prince Edward Island in the mid twentieth century, revolved around the farm and the fishery. Farming at that time was not industrialized as it is today. Horses plowed the fields and many were used for transportation in the local area. Livestock provided part of the family income as well as a food source. Therefore, keeping the animals healthy was of paramount importance. In his book Mud, Sweat and Tears, island veterinarian, Bud Ings, recounts his life as a vet in eastern PEI. At that time, his practice involved farm animals, their health and safety through the life cycle. However, by the late nnineteen sixties, it was changing, as people acquired pets and had money to care for them. Now, among the many vets on this island, the number specializing in farm animals is reduced as pet care takes the forefront of many practices. Every time we walk the boardwalk by the bay, we meet some of these pets accompanied by their humans. These dogs are pampered pooches, providing companionship, love and entertainment to their owners. While some may question the fascination others have with their four legged friends, these people know the importance of their pets in their lives and proudly speak of them when queried. Curiosity about the dogs has led to some interesting conversations for my husband, Rick and I as we meet people on the trail. Here are some of the treasured pooches we met this past winter. Bella was a ten month old golden retriever. She replaced a previous pet which died but she, too, has found her way into her owners' hearts. Lady Di was an eleven year old schnauzer, the fourth such dog the family has had and she is excellent with children. Her eighty-five year old owner walks her twice a day. Dylan, the golden doodle, was six years old. Her owners previously had a golden retriever which shed a great deal of fur. Dylan does not shed, incredible considering the long thick fur on this gorgeous animal. Sky and Rye were eighteen month old, red coloured golden retrievers, so there is twice the fur in their home. The dogs were impeccably groomed and accompanied by their young owner. Annie was an eleven year old cinnamon golden retriever. She was losing her hair until the vet diagnosed her with thyroid problems. Medication has resolved the issue. Annie enjoys the people more than the dogs she meets on the trail. Roxi was a four year old black golden doodle. She loves walking the trail. Charlie was a ten week old chocolate lab whose fur looked like velvet. He joined his family the previous week and they were still learning about each other. Charlie was anxious to keep going rather than stop to chat. Myla was a two year old Alaskan malamute, a breed of sled dog. 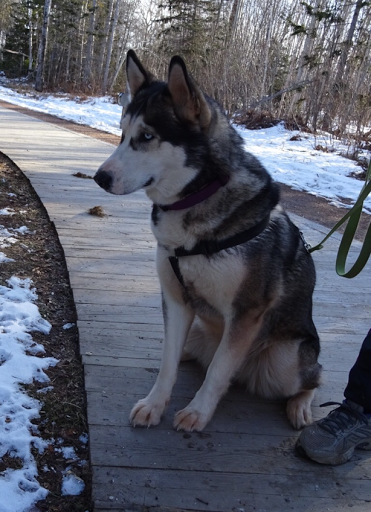 This beautiful dog was focussed on the squirrels in the woods just beneath the boardwalk. The owners had taken Myla to a golf course where they had her pull a sled around the course and she loved it. The boardwalk would not be the same without the parade of gorgeous pets and owners who frequent the area.